Haefele TV Inc, a local Spencer, NY based cable and internet provider is excited to be a part the New York State Broadband Initiative. This initiative is aiding Haefele TV Inc. among other service providers to help bring high speed internet via Fiber to the Home to Harford, Richford and Virgil areas. Fiber to the Home can accommodate up to 100 meg download speeds and has the adaptability to go beyond those speeds. This will be a welcomed and much needed improvement for many areas. Lee Haefele started his business in 1982 as a local cable service provider. 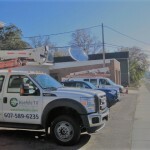 Not only has Haefele expanded the geographic areas in which the company offer services, but over the decades the company has expanded the product offerings to include high speed internet, WiFi, digital phone, and more recently Fiber to the Home. One aspect that hasn’t changed is Haefele TV’s commitment to fast, reliable customer service. “We have an amazing, dedicated team”, says Marketing Manager Amber Harris. ” It’s just like a family here, and we genuinely care about our customers. Because we have onsite local technicians, we can often fix a problem within the same day. Most of our staff have worked here for over ten years, and they are incredibly knowledgeable.” If you are interested to see whether Haefele TV Inc.’s grant covers your area, be sure to call their office at 607-589-6235 Monday through Friday between 8 a.m. and 5 p.m. Also be sure to check them out on the web at www.htva.net and on Facebook at www.facebook.com/HaefeleTV/.